Carmax (NYSE:KMX) rode improved unit sales in both used and wholesale vehicles to a much better quarter than Wall Street had expected. In the company’s second quarter ended August 31, sales were up 13% to $2.08 billion easily outpacing estimates for a drop of 4% that analysts had expected. Same store sales rose by 8%, which is far better than the 17% declines seen in the first quarter. Some of the credit for this is attributed indirectly to cash for clunkers. One analyst speculated that some of the increased foot traffic was from buyers who were interested in purchasing a car on the government’s program, but some of these interested buyers were unable to qualify for the credit. 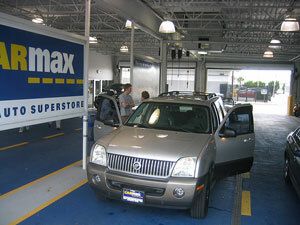 As the theory goes, some of those buyers turned to the cheaper alternative of Carmax to scratch the car-buying itch. The store traffic and sales numbers seem to back up this indirect benefit. No matter the reason, the results are tough to dispute. Carmax’s earnings rose more than 7-fold to $.46 per share compared to the extremely weak quarter a year ago which netted the company only 6 cents per share. Analysts had expected more modest earnings growth to 18 cents per share. Also, KMX was helped by much better performance from Carmax Auto Finance unit which saw net income of $72 million compared with a loss of more than $7 million last year. Adjustments to loans originated in previous quarters resulted in a large one-time gain of $36.2 million. Better sales and strict cost controls enabled Carmax to outperform analysts expectations, and the indirect effect from the government’s Cash for Clunkers program was bigger than almost anyone had imagined. Not surprisingly, the stock has roared higher today, up more than 9% in midday trading. At Ockham, we are reiterating our neutral or Fairly Valued rating at this time. The results for the quarter were far better than we had anticipated, but much of that performance is already reflected in the price. Given the current fundamentals, we think that a price around $19 would be reasonable to expect going forward. Furthermore, we have concerns that Carmax could experience some clunky sales going forward as a hangover from Cash for Clunkers. A report from Edmonds.com shows that post-clunker sales have hit a 28-year low to a rate of 8.8 million units per year. This is a 38% plunge from last month, and suggests that the government’s incentives simply pulled demand forward. This effect will likely be less direct for Carmax than it will be for the new car dealers, but as we saw with this quarters results Carmax is not immune from the effects of government intervention on the car-buying market. Carmax could certainly benefit from U.S. consumers saving more and spending less, which would translate to more modest car purchases. However, with a very rich valuation multiple of 33x based on trailing four quarters, we would recommend taking profits in a stock that is up more than 200% in less than a year. It will take some mighty impressive quarters to simply maintain this price, much less continue higher.